College of Professional Studies for Pre-school Teachers is located in southeast Serbia, in a town of Pirot, some thirty kilometres from the Bulgarian border. Although the College has a century old tradition in educating pre-school teachers the education reform in the first decade of the 21st century introduced various challenges ahead of our institution. Thus, immediately upon the introduction of the Bologna Declaration the College became focused on building the capacities which would create the foundation for the improvement of the quality of the teaching process and, consequently, learning outcomes. Having managed to build sufficient capacities and respond to the requirements of the aforementioned reform it is our goal in the upcoming period to place emphasis on internationalisation. Namely, internationalisation constitutes a crucial precondition for increasing the quality of teaching by means of improving the knowledge, skills, competences and experience of both students and teachers alike. Likewise, internationalisation is the most authentic manner of modernising and establishing innovations in the process of education, introducing and maintaining the European dimension of higher vocational education and spreading the idea of a unique educational space intertwined with national, cultural and language differences which are seen as an advantage in cultivating tolerance, understanding and multiculturalism. Hence, the aims of the College internationalisation strategy would be as follows: to improve teaching/learning processes at the College by means of staff/student mobility, to establish, maintain and improve the co-operation between the College and related higher educational institutions abroad, thus increasing international visibility of the College and its activities, to further improve the capacities of the College necessary for increasing the overall quality and becoming more competitive among the ever growing number of related higher education institutions. 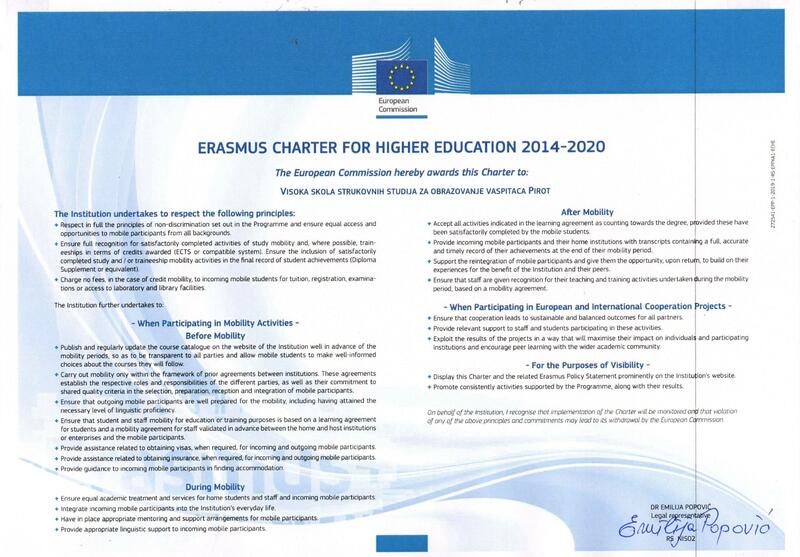 Bearing in mind that the College has not yet had the experience in student/staff mobility, one of the basic proposals of this strategy would be to primary establish Erasmus partnerships, i.e. to conclude inter-institutional agreements with related European higher education institutions. In accordance with the College specific geographical position, education field and tradition, it is the proposal of this strategy that the College should place its focus in terms of mobility on the countries in the region of Eastern Europe, primarily on Slovenia, Croatia, Macedonia, Bulgaria, Slovakia, etc. With respect to other types of Erasmus projects (strategic partnerships, knowledge alliances, capacity building), the College places its focus on the countries in the region of Western Europe. Regarding its target groups, the College internationalisation strategy encompasses all College employees and students. Therefore, the college wishes to focus on staff/student mobility for the purposes of increasing international dimension of the College, improving staff/students´ foreign language competences, intercultural skills, professional knowledge, sharing experiences and disseminating the European dimension of education. improving the curricula in terms of responding to the necessities of the labour market thus increasing students´ employability; enriched by examples of good practice provided through mobility and other co-operation projects we have better chances of devising curricula which would enable further co-operation, lifelong learning, learning transference, better chances of connecting with and informing the labour market. improving the management and College services which play a significant role in realising the College goals, being the basic structures of organisation and functioning. We focus on providing quality education to our students and continuous improvement of our staff. It is our aim as well as our desire to improve our study programmes, create new ones and improve our practice by looking up to the best practice in our common European space. One of the manners of accomplishing the aforementioned is through participation in various Erasmus + projects. College of Professional Studies for Pre-school Teachers in Pirot has participated in international co-operation project within the framework of the EU higher education strategy preceding Erasmus + (Tempus Programme) in an attempt to build capacities for further modernisation and teaching/learning process and practice reform. During that period, the College staff and students gained precious experience participating in an international project the result of which was significant improvement in organisation, management and functioning of a higher vocational education institution. Bearing in mind this particular experience, the College proposes to continue on that path and engage on both strategic partnership and knowledge alliance projects. Namely, our College strives for excellence in teaching and producing independent, self-motivating and innovative pre-school teachers with excellent organisational skills and skills of critical thinking. In order for the aforementioned process to be meaningful and beneficial it is necessary to establish much stronger bonds between education and work fields on the one hand, and among different education institutions, and even different fields, on the other hand. The desired communication and co-operation cannot be conceived without the compatibility between the educational contents and the real labour market requirements which condition employability of prospective graduates. Hence, within strategic partnerships our College would focus on the type of co-operation with relevant stakeholders which would result in the development of innovative practices which would establish a direct link between the needs of the society and learning goals and outcomes by resorting to adequate tools and contents, innovative teaching methods (both digital and pedagogical innovations), as well as development of entrepreneurial skills in students through co-operation with entrepreneurs and relevant social and educational institutions. Likewise, the College aims to develop transversal skills and creativity in our students by enabling them to opt for programmes developed through the co-operation with the basis (public and private institutions in the field of pre-school education), i.e. for programmes which would empower students to develop creative and critical thinking, independence in the choice of their career path and encourage them to pursue new practices and solutions. Although the College of Professional Studies for Pre-school Teachers in Pirot has managed to build some capacities and experience through the participation in international projects so far, there are numerous issues which leave room for improvement. It is our deepest belief that further international participation within different Erasmus + actions would immensely contribute to the modernisation and steadfastness of our institution. Namely, although our College was the first one in the country to introduce new approaches to pre-school teachers training ten years ago, embracing the new paradigm based on holism, integrative practice, project-based approach and theme planning, the unrelenting pace of technological development, as well as ever growing requirements of the labour market leave no room for intermission or pleasure with the achieved results. A constant improvement is a must if one wishes to stay competitive and relevant. It is the belief of everyone at the College, staff and students alike, that intensive participation on various international projects can help keep one´s head above surface. In the process of educating pre-school teachers it is a must to develop transversal skills and key competences, as they are the ones making the difference between an average and excellent prospective teacher (or any other professional for that matter), i.e. between considerable and limited career opportunities. In order to develop the aforementioned skills, the College aspires to enable the students to study by resorting to the latest teaching/learning methods and tools. This can be done by innovating curricula and introducing short-cycle programmes, by attending such programmes during the periods of mobility, etc. Furthermore, in order to be able to assume a more significant role in the society regarding equal opportunities and social inclusion the College aspires to become involved in Erasmus + actions – inclusion strategies implementation, awarding ECTS points for voluntary work and community activities, developing programmes which would encompass local, regional and societal issues. It is, therefore, one of the objectives of our College to help students develop those skills by means of international co-operation.